The Ballybunion half marathon is the creation of some wonderful local people for Ballybunion Town John and Joan O Connor and Pat and Rose Tracey. Each year this group of people organise a weekend away in the Heart of the Kingdom at Ballybunion. The Ballybunion half marathon course is a perfect 13.1 mile loop along the beautiful North Kerry coastline. Starting in the town you will encounter wonderful views of the beaches and cliff tops. Travelling north you will run along the Shannon estuary where the spectacular scenery will shorten your journey. The run will take you past the unspoilt Beale strand before the turning for home a few miles short of the village of Asdee. The last few miles will take you back to Ballybunion where the coastline is never far from view. The course is both scenic and challenging with some interesting inclines along the route and a very fast downhill finish. The Ballybunion 10k route is an "out & back" course along a scenic section of the half marathon course. 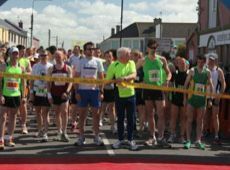 Both the half marathon and 10k start at 2pm from Main Street Ballybunion. The entry fee for the half marathon €50. The entry fee for the 10k is €20. A runners pack with your number, information and chip can be collected from the event office at Main Street Ballybunion from 4pm to 7pm on Friday March 29th and from 10.30am to 1.30pm on the morning of the races. Chip timing will be provided for both the Half Marathon and 10k events. In 2011 we introduced a Fun Run, specifically for the children. They started at the same starting line as the adults and completed a circuit of the town, almost 1k. to look back at the faces in the years to come! All children were presented with a commemorative t-shirt. Their participation in and enjoyment of the day added greatly to the occasion. We would like to remind parents that all children are welcome again next Easter so please bring all the family, it`ll give the X Box a well earned rest.